Imagine a beautiful sunny day with the company setting out for their mystery hike, blindfolded and bundled into the back of a mini van. If we hadn’t seen them all go off so peacefully we would have thought they were being kidnapped. But no, their fate involved a map, a compass and a lot of walking. However, not us! Physically impaired yet still inspired, unable to take part in the outbound antics due to a variety of injuries, the (special) team were empowered to choose how they spent their afternoon. 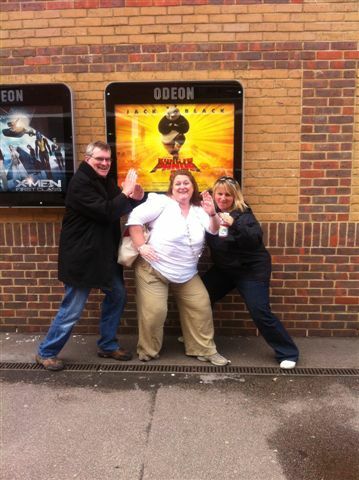 After some serious consideration there was a clear winner…Kung Fu Panda in 3D at the Odeon, Guildford. Two of our values – connection and progressive – formed the theme of the day. We lived these to the full, connecting via hot dogs, wearing each others’ popcorn and Simon made progress as he had never experienced life in 3D. With the help of Kung Fu Panda we reflected and recognise that inner peace and choosing who you are, right now and in the moment is a key lesson. We ended our day connected, inspired and a bit sticky (from the popcorn)! This entry was posted on July 28, 2011 at 9:47 am and is filed under Blue Sky Events. You can follow any responses to this entry through the RSS 2.0 feed. You can leave a response, or trackback from your own site.